I thought I’d share a paper I wrote from last semester’s Comparative Psychology class on handedness in humans and geladas. Debating if I should actually follow through with this preliminary report and do some data collection. There is a YouTube video that accompanies this paper, which will appear on the bottom of the page. Handedness can be defined as the unequal distribution of fine motor skills between the left and right hands. Simply put, handedness is the preference to use left, right or both hands when performing tasks. Humans are mostly right-handed across cultures. Here, I compare handedness in humans (Homo sapiens) to handedness in geladas (Theropithecus gelada). Right-handedness is predominant across cultures in humans. About 85% to 90% of humans report themselves as right-handers (10). In studies of great apes, comparative analysis indicates that chimpanzees and bonobos exhibit population-level preference in right-handedness while gorillas and orangutans do not exhibit population-level preference in handedness (10). However, right-handedness seems to be uniquely human as no other primate species has such a clear bias (1, 13 & 14). The objective of this preliminary study is to elucidate whether geladas exhibit preference in handedness. A male gelada at The Bronx Zoo. Geladas are Old World Monkeys and can be found in the high plateau of North Central Ethiopia and Eritrea (9 & 2). Geladas are sometimes referred to as “bleeding heart monkeys” due to the presence of a naked, pink patch of skin on the chest of males and females that looks like an hourglass (2). They exhibit sexual dimorphism; males have manes and are slightly larger than females. The maximum lifespan of a gelada is about 19 years in the wild (5) and well over 30 years in captivity (9). Geladas are gramnivores; they are unique among primates because grass is their main food source but is occasionally supplemented by seeds, roots, and bulbs (3). There are many definitions of handedness. Here, I define handedness as the preference of left, right or either hand when performing tasks. In humans, those who have a preference for using their right hand are right-handed while those that prefer using their left hand are left-handed. Those that prefer to use either hand when performing tasks are ambidextrous. 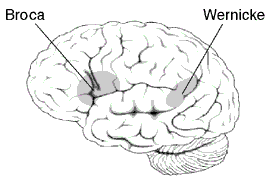 Approximate location of Broca's area and Wernicke's area. Photo from Wikipedia. Handedness is due to the lateralization (asymmetry) of the brain hemispheres. Those that are right-handed have a more dominant left hemisphere, while those that are left-handed have a more dominant right hemisphere. In most humans, the left hemisphere of the brain is more dominant. The left brain hemisphere is also involved in language and is where Broca’s area and Wernicke’s area are located. Broca’s area is involved in speech production while Wernicke’s area is involved in language comprehension. Right-handed preference is deep-seated in hominid evolution. Analysis of stone tools from Lower Pleistocene sites in Koobi Fora, Kenya and Middle Pleistocene sites in Ambrona, Spain showed that there is a consistent pattern of tools being produced by right-handed Homo habilis and Homo erectus (15). Preference for right-handedness may have existed as early as 1.4 to 1.9 million years ago, and might hint that the hominid brain had lateralized and was well on its way to becoming more specialized for different functions (15). Analysis of scratch patterns in incisors and canines from archaic humans (Sima de los Huesos in Atapuerca, Spain) and European Neandertals (Sima de los Huesos in Atapuerca, Spain and Vindija, Croatia) also showed that there was a persistent pattern of right handedness (6 & 7). 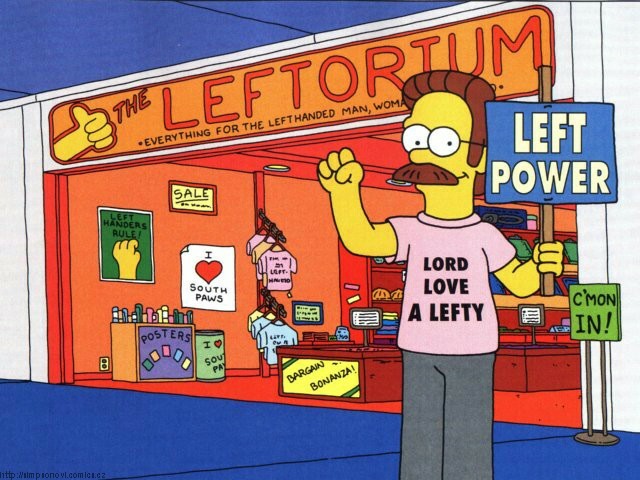 The prevalence of right-handedness in humans has a linear correlation with left hemisphere dominance (12). Since the left brain hemisphere plays an important role in language, brain lateralization leads to right-handedness. Thus, the prevalence of right-handedness in humans is a byproduct of human language. 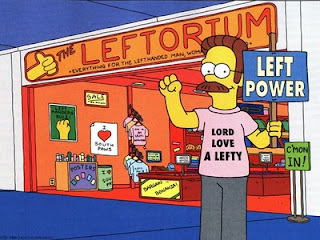 The left-handed Ned Flanders from The Simpsons. 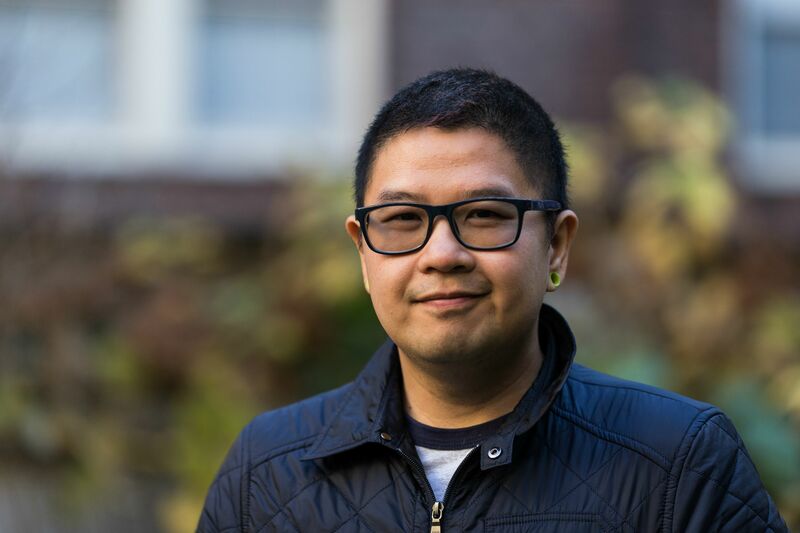 Photo from SF Weekly. The subjects for this study are from a captive population of geladas at The Bronx Zoo (Wildlife Conservation Society). There were 7 individuals present during the observations and all were male. Observations were done on two separate days between 12 P.M. and 3 P.M. The geladas were recorded using a video camera, and the recordings were later analyzed. Geladas spend a significant amount of their time foraging (8). Site studies show that geladas spend 35.7% to 81.6% of their time foraging (8). There is a positive correlation between altitude and time spent foraging; more energy is burnt at higher altitudes, therefore more time is spent foraging (11). A male gelada foraging with both hands. My observations showed that geladas use either hand while foraging. They use either their left or right hands to pick up bunches of grass to eat. As my observation progressed, I became concerned that their repetitive motion of picking up grass and putting it in their mouths was not a sufficiently varied behavior to indicate handedness. Therefore, I also observed the geladas grooming. A female gelada grooming herself. There are two types of grooming in geladas: autogrooming (self grooming) and allogrooming (social grooming). Grooming is not only important for hygienic reasons but also important for strengthening social bonds (4). A study by Dunbar suggests that the major reason for grooming is the satisfaction of physical contact between the groomer and the individual being groomed (4). From my observations, allogrooming starts with the individual being groomed initiating eye contact with the groomer. Then, the individual lies down and presents the area that needs to be groomed. Sometimes, a groomer simply approaches the individual they want to groom and starts grooming them. My observations showed that there is also no preference for which hand is used by geladas during grooming. The geladas used either hand for both autogrooming and allogrooming. The decision to use their left or right hand seemed to be determined by the area of the body that needed grooming. From my observations, it seems that the geladas use either hand for foraging and grooming. The geladas at The Bronx Zoo seem to exhibit ambidexterity because they have no preference for their left or right hand, unlike humans who are predominantly right-handed. Handedness is correlated with brain hemisphere dominance. For most humans, the left brain hemisphere is dominant and is also involved in language. Thus, the prevalence of right-handedness is a byproduct of human language. None of the geladas I observed at The Bronx Zoo exhibited preference for handedness. This is probably due to the fact that geladas do not have language; therefore, their left brain hemisphere is not dominant and does not lead to right-handedness. Besides foraging and grooming, more behavioral repertoire should be used in future analysis to further elucidate the preference in gelada handedness. 1. Cashmore, L., Uomini, N., & Chapelain, A. (2008). The evolution of handedness in humans and great apes. Journal of Anthropological Sciences, 86, 7-35. 2. Dunbar, R.I.M., &; Dunbar, P. (1975). Contributions to Primatology: Social Dynamics of Gelada Baboons (Vol. 6). Basel, Switzerland: S. Karger AG. 3. Dunbar, R.I.M. (1984). Reproductive Decisions. Princeton, New Jersey: Princeton University Press. 4. Dunbar, R.I.M. (2008). The social role of touch in humans and primates: Behavioural function and neurobiological mechanisms. Neuroscience and Biobehavioral Reviews, 34(2), 260-268. 5. Falk, D. (2000). Primate Diversity. New York and London: W.W. Norton & Company. 6. Frayer, W.D., Fiore, I., Lalueza-Fox, C., Radovčić J., & Bondioli, L. (2010). Right handed Neandertals: Vindija and beyond. Journal of Anthropological Sciences, 88, 113-127. 10. Hopkins, W.D. (2006). Comparative and Familial Analysis of Handedness in Great Apes. Psychology Bulletin, 132(4), 538–559. 11. Iwamoto, T., & Dunbar, R.I.M. (1983). Thermoregulation, Habitat Quality and The Behavioural Ecology of Gelada Baboons. Journal of Animal Ecology, 52, 257-366. 13. McGrew, W.C., & Marchant, L.F. (1997). On the other hand: Current issues in and meta-analysis of the behavioral laterality of hand function in nonhuman primates. American Journal of Physical Anthropology, 104(25), 201-232. 14. Steele, J. & Uomini, N. (2009). Can the Archaeology of Manual Specialization Tell Us Anything About Language Evolution? A Survey of the State of Play. Cambridge Archaeological Journal, 19, 97-110. 15. Toth, N. (1985). Archaeological Evidence for Preferential Right-Handedness in The Lower And Middle Pleistocene, and Its Possible Implications. Journal of Human Evolution, 14(6,) 607-614.